Assistant coach Cleber Xavier tells Arab News that Samba stars know Saudi Arabia are an experienced side. Brazil have one eye on Copa America, while Green Falcons are looking toward the Asia Cup. RIO DE JANEIRO: Brazil’s assistant coach Cleber Xavier said his team of superstars are taking nothing for granted ahead of their clash with Saudi Arabia tomorrow night. 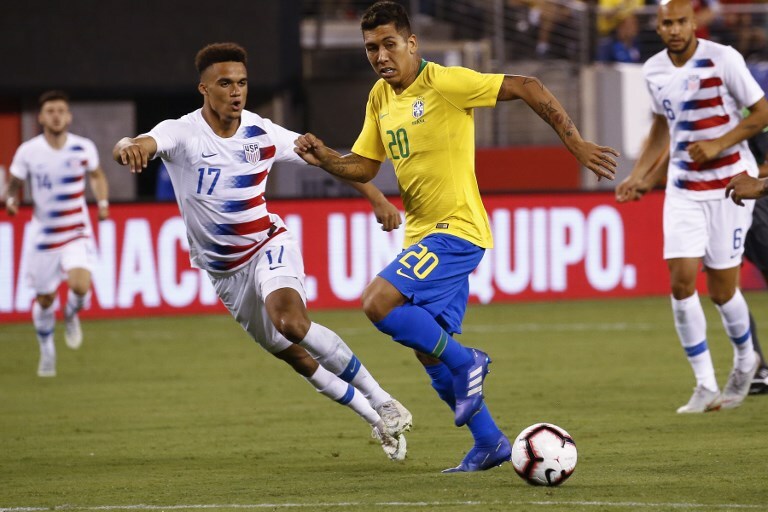 Neymar, Roberto Firmino, Gabriel Jesus and Philippe Coutinho are all set to feature against the Green Falcons in Riyadh’s King Saud University Stadium — the sort of firepower any team in the world would love to have. But Xavier insisted Neymar and Co. would not be taking Juan Antonio Pizzi’s men lightly. “(Saudi Arabia are) a team that we respect,” Xavier, who has worked as coach Tite’s assistant at various clubs since 2001, told Arab News. “For us, it is a team that we have to pay attention to. We can’t be surprised. Each and every game more, we have that notion of respect for the opponent. Brazil are currently in a rebuilding process after the World Cup where they exited in the quarterfinals against Belgium, without ever looking like they would justify their favorites tag. The 23-man squad includes three fresh faces with Bordeaux defender Pablo, Hannover midfielder Wallace, and Barcelona striker Malcom. Roberto Firmino is just one of many big names set to be on show in the Saudi Arabia capital. The strategy to introduce newcomers in the team is part of the side’s planning as they seek to win the Copa America on home soil next year. “The Selecao are in a phase of transition,” Xavier explained. “In the short term we look to observe and give opportunities to players we haven’t given a lot of opportunities to. Saudi Arabia last played Brazil in February 2002 — a second-half strike from Djalminha was enough for Brazil to secure victory at the King Fahd International Stadium in Riyadh. Having watched Saudi Arabia’s friendlies with Germany, Italy, Belgium, Peru and Bolivia, and the team’s three matches at the World Cup, Xavier expects another good contest this time around. “Antonio (Pizzi) plays with a 4-1-4-1,” Xavier said. “It is a team with quick transitions, a team that doesn’t play the long ball, but likes to play for both the build-up and for transition with a compact and constructive game. The team has different, interesting players: Fahad (Al-Muwallad), the central striker; (Yahya) Al Shehri on the right and (Salem) Al-Dawsari on the left, who is the team’s main player. He has a good strong right foot, cuts inside and finishes. Salem Al-Dawsari is the man the Selecao know well from his time at this summer's World Cup. In September the Green Falcons drew 2-2 with Bolivia in a friendly, a disappointing result having led 2-0 after 11 minutes courtesy of goals from Al-Shehri and Al-Dawsari. After that match Pizzi was left to lament a lack of concentration and discipline. “The (performance) against Bolivia was of inferior level to the World Cup and the preparation games for Russia,” Xavier said. “Pizzi had an interesting game against Germany, but lost 2-1. An interesting game against Italy as well, which Saudi Arabia lost 2-1. “Saudi Arabia also had an interesting game against Belgium, even though they lost 4-0. It is a team that seeks to play. Saudi Arabia’s outing with Bolivia, the Falcons’ first match after the World Cup, began the build-up to the Asian Cup next January in the UAE, where Saudi Arabia have been drawn alongside Qatar, Lebanon and North Korea in Group E.
“There are a few plans that (Pizzi) can make specifically for this game and we have to be watchful of the danger situations,” Xavier said.